This month was another squirrel month! How about you? This green bird feeder is the best deterrent to squirrels stealing all the bird food. Kind of like Island Batik challenges and their deadlines making me put on blinders and NOT follow the squirrels!! Do you see how she puts her paw on the step where the birds perch? That closes the little window to getting at the bird seed inside the house. Amazing, and the only one that has effectively prevented squirrels from pigging out. As you know, Dayna, my youngest daughter, is getting married...today! (Yay for scheduling posts.😉) When I took her to Traverse City, Michigan, I wanted to give her some meaningful gifts. She hadn't had, didn't want, a shower, so taking her there was a part of my gift; the others were the quilt, my RSC2018 quilt, she'd commented on on Instagram that she'd like to claim, a gift card to the Canadian store Home Sense, and a small makeup case for her big day. 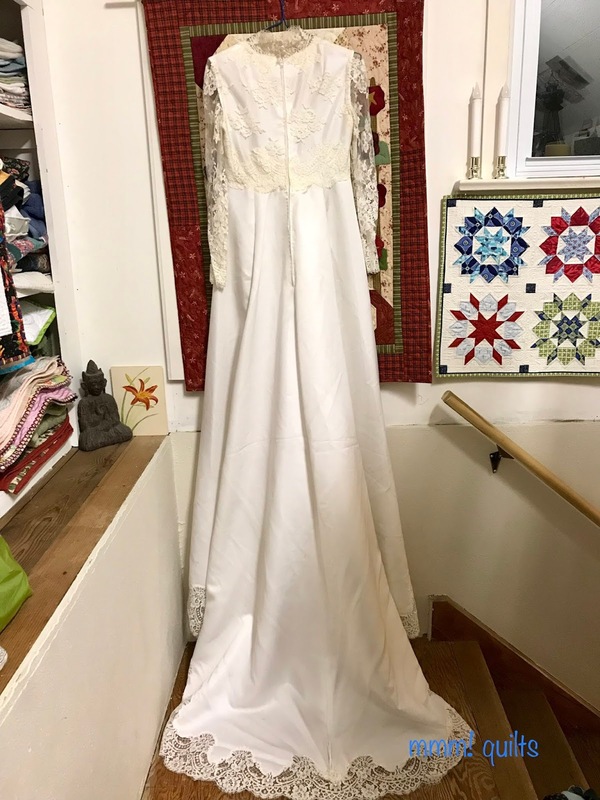 I had planned to cut up my own wedding dress to make it, and give her some of the very expensive lace I'd bought to edge the hem and the bodice for her bouquet. The lace is hand-stitched all the way around the hem. 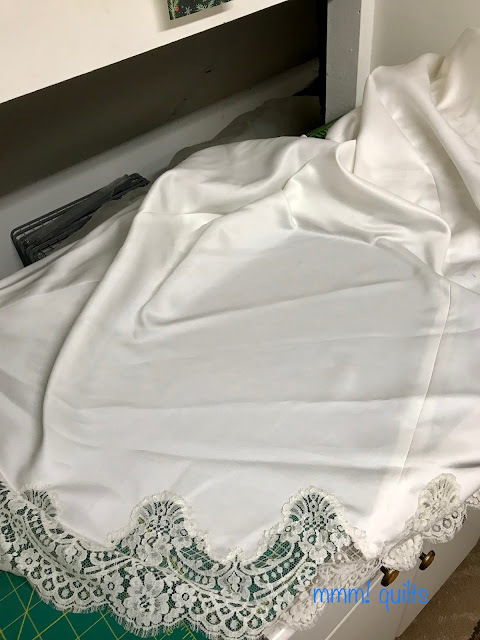 I thought I could incorporate the full-length lace sleeves, making an overlaid makeup bag much like the bodice of the dress. Gorgeous no? Where my wrist is is the lower edge of the sleeve, a lovely scalloped edge. Okay the squirrel was still nibbling at my brain and I had to do this, so I dug through a plastic tub where I have some odds and ends of lace, and found, not in the container, but beside it, a half yard or so of lace. 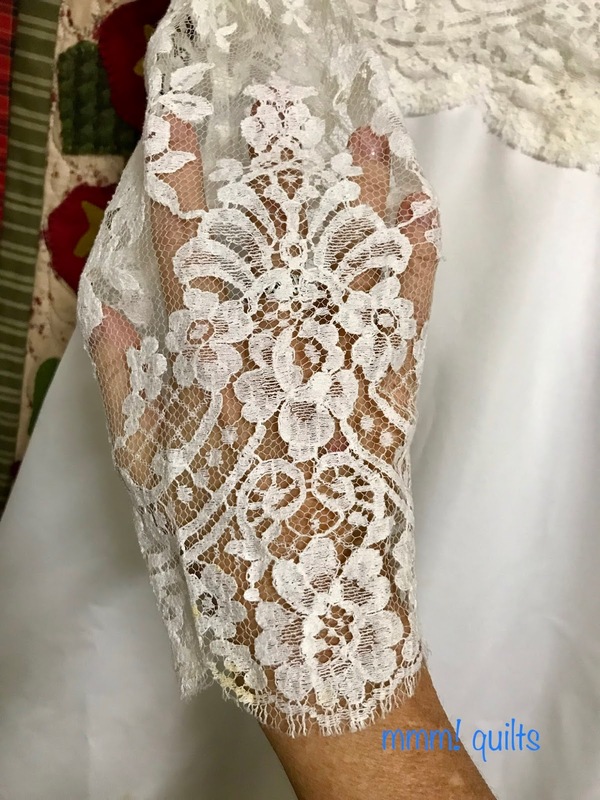 This isn't from my wedding dress, but I think I used it to make potpourri holders which would put its age at about 25 years old. Then I recalled that Island Batik had given us a yard of basic colours in Box 2, black white and grey. The white was gorgeous and perfect. The lace overlay took it to another level. In no time at all I had my makeup bag. It's a simple envelope design and the tutorial I basically followed is here. 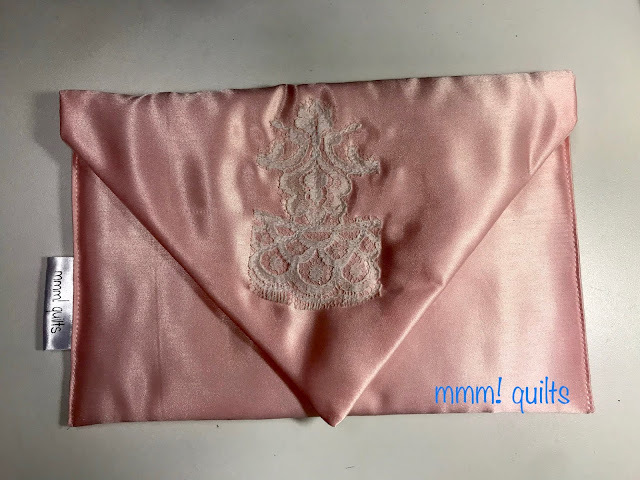 For the lining, I found a scrap of 100% silk, very expensive, which I'd bought at The Bay for a dress I made before I had kids! This lining, besides being beautiful, luxurious and butter-like, is a nod to my mum, Dayna's nana, who liked bags and purses "with a bright lining." I used Hobbs Thermolam as the batting. It's perfect, thin but has loft as well. It closes with a magnetic closure, and my mmm! quilts label is on the inside of the bag. 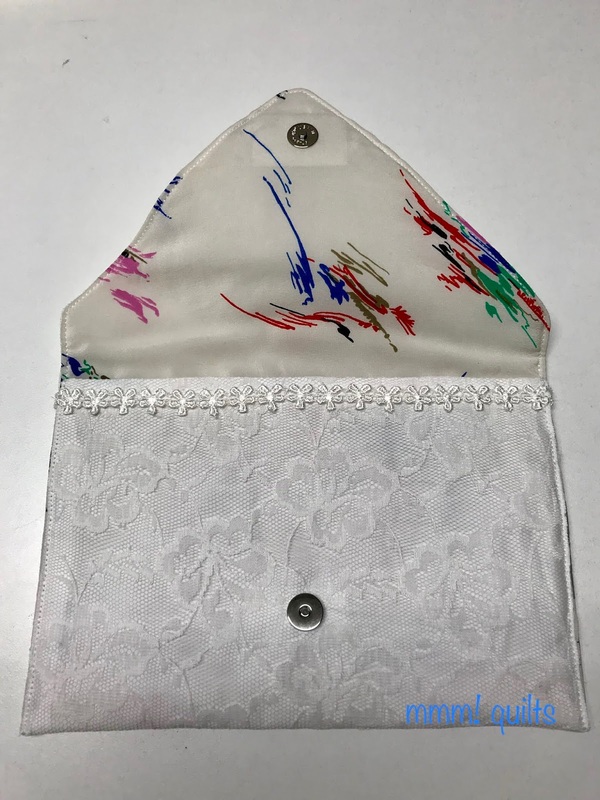 The daisy lace you see along the top edge of the bag? It's from my veil. Yep, I cut it off. The headpiece part of the veil is actually my mum's that she wore on her wedding day. It will be 60 years old in February 2019. 38 years ago, for my own wedding, my mum's headpiece was my borrowed item; I replace the netting and edged it with the daisy lace. Dayna loved this little bag, and said she can even slip her phone inside as well. We didn't have to worry about that when I was married in 1980! I made a test bag first before I cut into the batik and lace. This one is another satin, a piece I'd bought several years ago to make a camisole I think. It has a batik lining, but I don't know what company of batiks as I bought it at a quilt shop in Windsor this summer. It's the palest of pinks you can imagine, with the odd splash of a bit deeper pink. Bella was the overseer for this first bag. The combination of satin and batik works really well. This one has a small piece of lace I cut out of the scrap I had left from my dress. I machine appliquéd it in place. The tag is on the outside as you can see. 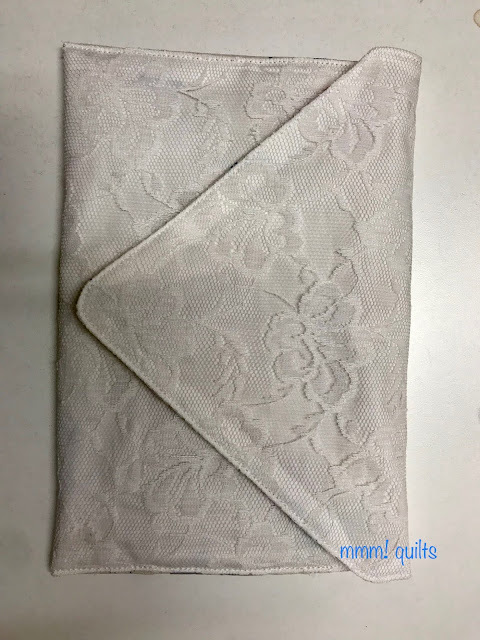 I used a magnetic closure on this one as well, and edged the top of the pouch part with lace from my veil. This one will go to Brianne to use on the wedding day. Let's see what squirrels you pursued this past month! Cutting up one's wedding dress is a hard decision to make (if you are still happily married, I saw a news article showing that one divorced bride blew her's up once the divorce was final!). The make up bags are beautiful. Hope the wedding goes off smoothly with just minor hitches. As much as I remember The beautiful moments during our wedding it's all the little things that went wrong we tend to talk about when our anniversary rolls around each year. Your DrEAMi bags are wonderful, Sandra! What a special thing for both of your girls to have on a very special day! Wishing you a wonderful day! What a grand idea, and I'm glad you didn't cut up your dress! I have mine tucked away, just in case my daughter wants it someday. Anyway, I hope the wedding and all the festivities is just fabulous! Enjoy! Beautiful bags. Enjoy this special day to the max. 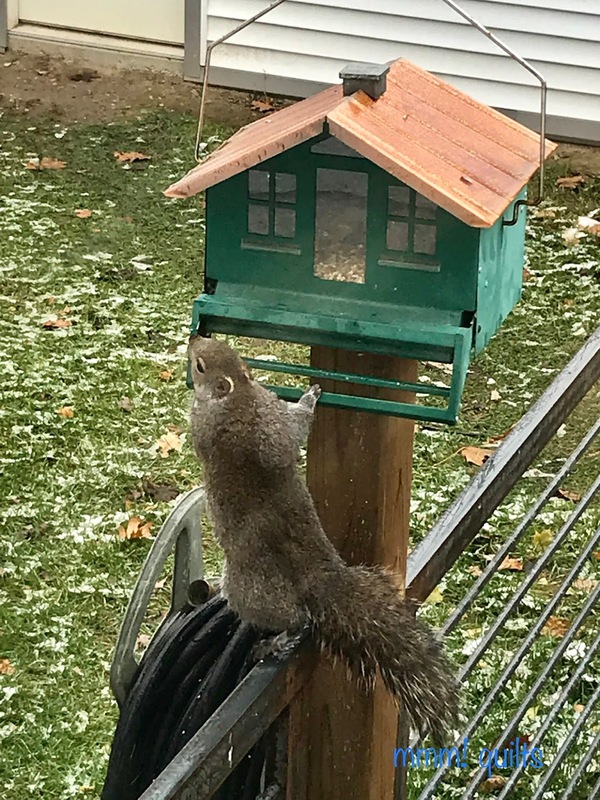 Not sure how long you've had that bird feeder but the last time I had something similar, the squirrels figured out how to sit on the roof of the feeder and hang upsidedown to eat the seeds. Clever little rascals. Love those bags! Those squirrels can become adapt at getting seeds, hopefully your bird feeder keeps on working. Happy day to your family! We have two of that exact same feeder! No squirrels, but Magpies and Doves. Works tremendously well! I knew you couldn't cut into your dress! That's perfectly okay - what you've done with the make-up bags is wonderful and a very loving gesture on your part. I'm sure they will love them! You'd best make yourself one, too, to complete the circle. Forgot to say: Congratulations on the big day today - enjoy!!! That bag is perfect! Dayna will love it and having a purse for the phone - well - priceless I am sure. Lovely nod to your mum, too. Hope it is a ridiculously fun and awesome day for her and you. What a great solution for the bag, Sandra, and just right. I hope today is a wonderful day of celebration! Happy Day Danya and Sandra, Your lace is so like mine from 1962, I bought a roll for 25 pound, huge money then as my weekly pay was 11 pound. I will email a photo of it in the skirt in March this year. The bags, beautiful, and what memories you will all have of the generations that share together. You're bags turned out gorgeous, and just perfect for your daughters. Know today will be such a beautiful celebration and the day will fly by, but you will have some great memories and sore feet at the end of this day. I couldn't cut up my wedding dress either. The lace covered purse you made is just perfect though. Congratulations to all. Naughty little squirrels! We’ve just had to get parts to repair one of our feeders that a squirrel damaged ..... they are such horrors! You saying “a white squirrel”, I thought you meant a real one and I thought snap, ‘cos we had one in our garden last week! I’m glad you didn’t cut your dress in the end, far too sentimental! 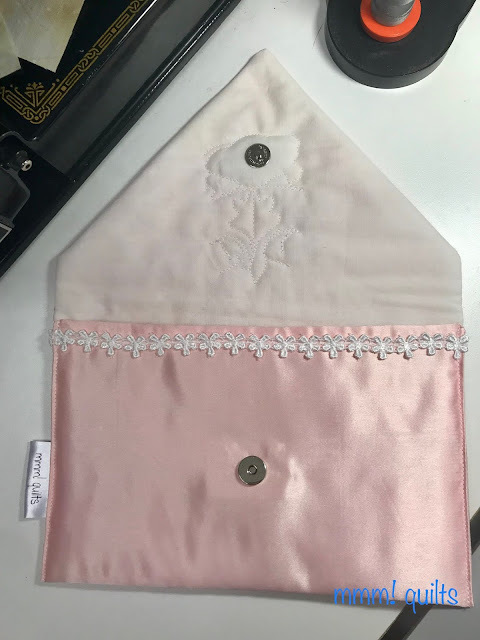 The bags are fantastic even without the dress fabric! I hope you all had a wonderful day, look forward to seeing the photos! Those are the most beautiful squirrels I’ve ever seen! Lucky girls! I cannot wait to see pictures of the wedding! I have goosebumps down my legs as I type! Awesome gifts! I hope the wedding went well. Gorgeous ideas, Sandra! I am certain that your girls love the sentimental bags you made. They're just gorgeous! Thought and beautiful! I love that you made two. I would love to see you make one for yourself too. 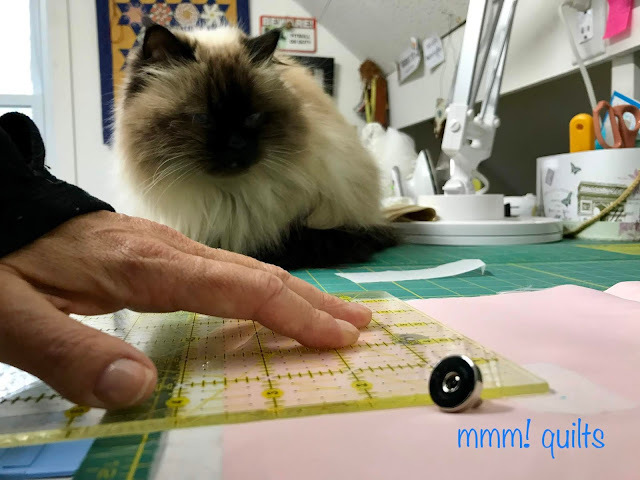 Bella was definitely making sure that you did a good job, and you did!! Gorgeous wee purses - and so meaningful too. and I had a squirrel. Luckily I haven't acted on it. It can be my squirrel for next month. And we have a squirrel in our garden! Big excitement for us, we are fairly urban, not squirrel territory.